Please deliver to.....: Oh, I like your silhouette. Can I buy it a drink? Oh, I like your silhouette. Can I buy it a drink? My best friend joined the blogging world shortly before I did. In fact, it was at her urging, *cough*bullying*cough* that I started my mail blog. 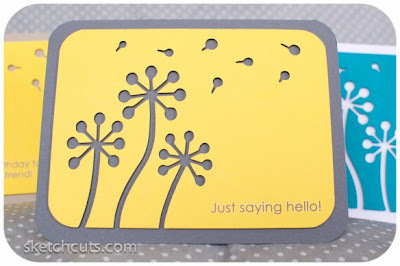 Her blog, Sketch Cuts, is about card-making, specifically the things she learns to do with her new silhouette cameo machine. Now, don't be fooled like I was, a silhouette machine does not make silhouettes. I know, it makes ZERO sense to me too. What kind of world do we live in where the name of the machine doesn't refer to its function?! What would happen if toasters suddenly started blending, or whisks started vacuuming? It would be ANARCHY!!!!! The laws of gravity and science would be flipped upside down. Perhaps I should write the silhouette machine company a polite but firm letter, urging them to consider a product name change to something like "Machine-that-cuts-paper-and-other-related-things-that-I-don't-quite-understand-yet." Rolls off the tongue, doesn't it? However, I understand that my suggested name isn't very marketable, so I'll also offer the acronym: MTCPORYTIDQUY. No, no, I won't accept payment, I offer my services for free. Anyway, back to the point: if it wasn't for my best friend, I wouldn't be part of this blogging world with the great, big following of TEN people (that's according to blogger followers, I'm sure there are some scragglers out there who follow through other technological means that are beyond my capabilities to understand, so let's round that number to a huge TWELVE—Justin Bieber, eat your heart out. Beyonce? You've got nothing on me!). Want a free, awesome handmade card? If you need further incentive to visit her blog: I am the proud recipient of all these great silhouette cards! The intent was to include her cards as extras in my penpal letters. She's an awesome supporter of my snailmail; she's even trying to make me my own airmail and TARDIS stamps!! So take a look at her creations, if you see one that you really like, leave her a message and then come back and let me know which one you liked! I'll send you the blank card for your own use (available while quantities last on a first come, first serve basis). Consider it blog karma, where you get a great card for your efforts. Everyone is a winner!! Don't forget to leave me your email address so I can contact you for your mailing address. I'll finish by saying: My best friend is the BEST. You lovely blog readers endure my insanity for little bursts every few days; poor Jinnee has been putting up with me for the last 12 years... show your sympathy by supporting her blog, will ya?! Thanks for the Sketch Cuts promo and referral! "Blog Karma" is genius!! Too difficult to choose. I would be most happy to receive any of them, as they are all adorable! Sender's Choice - if you please!!! You know what is a GREAT way to show thanks? Sushi. Sushi screams "thanks." I'm a letter writing gunslinger! It's showandmail and tell day!